Jared Hodgkiss spent seven years with FGR making a total of 169 games and scoring five times. He had also been given the captains arm band many times. Born in Stafford, he started his career as a trainee with both Wolves and then West Brom with whom he made fifteen appearances after he signed professional forms for them. He spent time out on loan at the likes of Aberdeen and Northampton too before getting released at the end of the 08-09 season and joined FGR a few weeks later. 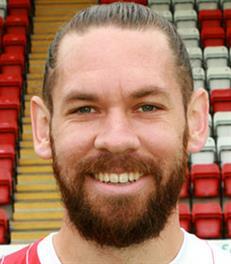 He joined up with the Harriers on an initial one season contract in June 2014 and signed longer terms a while later. He was the team captain for a few seasons before joining Torquay Utd on loan in January 2017. At the end of the 2016-17 season Jared left the club and joined up with Macclesfield Town.